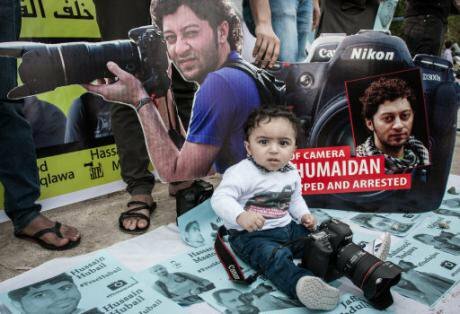 S. Reda Humaidan, son of the detained Photojournalist Ahmed Humaidan who was arrested in January 2014 for covering Bahrain uprising. Photo: NurPhoto/ABACA/PA Images. All rights reserved. The Day of Rage may have been the beginning of Bahrain’s national uprising, but the roots of this civil resistance lay much deeper. The series of protests that erupted on 14 February 2011 were organised exactly ten years after the National Charter, which committed to the transformation of the country into a constitutional monarchy, was approved by nearly 95% in a popular vote. A year after that display of common suffrage, the monarch moved to curtail the newly established democratic powers of the parliament. When Bahranis took to the streets on that morning in 2011, they were reminding the monarch of the unfulfilled democratic transformation that had been promised to them ten years before. Inspired by similar uprisings in Tunisia and Egypt, social media was an integral part in the organisation and coverage of the protests. Abdulhadi Al-Khawaja, one of the most prominent Human Rights Defenders (HRDs) in Bahrain leading the pro-democracy protests, was an popular influencer. His highly visible position and his long history of building a human rights movement in the GCC made him a target of the state, and on 9 April 2011 he was arrested. Two months and a half later, a military court sentenced him and eight others to life imprisonment, and he is still in prison today, where he wrote of the screams that echo through ‘Building 10, Jaw Prison’ from victims of torture. Behind each Human Rights Defender's story there’s a force that’s so strong that it keeps going no matter what. High-profile cases such as Abdulhadi’s are a warning to civil society. Since 2011, throughout the Middle East and North African region, governments are becoming stronger and the space in which civil society can operate has been shrinking. Much of the hope that emerged during the Arab Spring has turned into fear. But not everyone has felt deterred. Throughout the region, brave and determined Human Rights Defenders (HRDs) and the organisations that support them fight on. Elsa Saade, of the Gulf Centre for Human Rights, explains how the human rights landscape has changed since 2011, how civil society should adapt and why there is still hope. Did the Arab Spring uprisings of 2011 deliver the changes that society demanded? The big change has been that governments became much more aware of what their citizens can do, not just through online channels and social media, but also physically, when they went down to protest in the streets. While protests broke down the fear of people calling for their rights, it increased their fear of governments leading up to more crackdown. Since then, governments have been building their capacity to mitigate the ‘risk’ of similar events. Throughout the region we’ve seen them impose their authority over their citizens through a various ways which have led to an alarming shut down on civic space. In Egypt for instance, we’ve recently seen the authorities clamping down on Non-Governmental Organisations (NGOs) and their funding, working away at the last bit of hope they had to work with in improving human rights, alongside all the systematic targeting of HRDs that has been happening since 2011. In Syria, we’ve seen a constant increase in threats, disappearances, torture and killings. We’ve heard of the death of HRDs like Bassel Khartabil, for example, which we learnt of two years after their killing in detention. So many HRDs find themselves in limbo between the need to be in exile for safety and the need to stay in their country in order to be able to reveal the truth – regardless of the higher risk of death. In Bahrain, we’ve seen HRDs travelling to the UN to share their stories return to travel bans, or in the case of Nabeel Rajab, simply put in jail for tweeting. And then we have countries like the UAE, Qatar and Kuwait, where the authorities claim to have a great human rights record, and that their citizens enjoy freedom of expression, while they increase domestic surveillance – buying equipment from European based companies, that enable them to repress freedoms, and instigating a culture of consumption rather than of accountability and questioning. As governments have become more and more powerful, with the help from Western companies and governments, civil society is finding it harder to keep up given the constant need to be vigilant and strong. With little to no time for reflection and consideration for their own well-being. It has also been harder to communicate – both domestically and regionally. The shift between physical and virtual communication has been extremely loose to our advantage sometimes, but mostly not. This is something we’ve seen at the Gulf Centre; it’s becoming increasingly difficult to get people together and talk about their resistance. What risks are HRDs now facing on a day-to-day basis? It varies, depending on the country and context. Civil society members generally face imprisonment, travel bans, defamation, having their bank accounts frozen, threats to their families, exile, or death – especially in Syria and Yemen, there have been a lot of killings. The main thing we’ve seen is that due to the systematic targeting of known influencers, and known main key players in civil society, this sets a precedent of deterrence. And though most HRDs we know are not deterred and keep going, these risks that they face on a day to day basis in many cases cause self-censorship, burnout and depression, and withdrawal. People don’t feel they are able to exercise their freedom of expression or their lawful work in human rights the same way they thought they would be able to. Those fearless protesters are still courageous but the precedents have become many thus the number of protesters has shrunk in a way. These conditions have lead us to prioritise building solidarity nationally and cross nationally. It is of utmost importance to know that someone out there knows what you are going through and would support you no matter what the circumstances are as long as both of you hold the same values of “all human rights to all people”. Have you seen cases of government’s colluding with one another? Yes, for sure. We’ve seen how governments mirror each other’s authoritarian practices. What works in one country is adopted in another. And they’ve studied the strategies of HRDs, and used them against them. For example, seeing its success in places like Bahrain, governments have increased surveillance of Twitter and Facebook to help them identifying ‘risks’. But they’ve also seen the success of mainstream media, in creating sectarian propaganda across the region, as well as unverified news stories that inspire aggression towards HRDs and their organisations. It’s very difficult to mitigate that risk on our end. The media promotes a sectarian narrative which divides the region, and people in one country feel that they shouldn’t support the human rights fight of people in other countries. We saw this in Bahrain, where the opposition – which is mostly Shi’a – find it difficult to support Sunni HRDs in Syria, due to the fear the media has instigated, and vice versa. We see the media have a similar impact between Iran and Saudi Arabia, or even within countries. This ultimately helps governments and causes a divide in the regional solidarity we need to overcome the challenges we’re facing in terms of calling for our basic human rights and maintaining the space to call for them. How do ongoing civil conflicts in the region impact your work? These conflicts have come with an international focus that has been mostly on anti-terrorism, IDPs, refugees, and political sectarian feuds (as the media portrays it and as it made the mass public believe). As the focus barely shifts to the work on laws and the calling for basic human rights, the support those HRDs need in terms of finances for instance is close to null. With the exception of a few funding organizations around the world who do an excellent job identifying gaps and needs, the general norm is that funding organizations have certain agendas, and they would fund only the organizations or individuals with those agendas. In Syria, we’ve seen how CSOs were also in clash at several points because of unorganized funding. We’ve also seen how the media’s focus on Syria more than Yemen lead to Yemen being overshadowed at different points in time. All these factors affect HRDs in conflict areas in terms of the practicality of their work, thus of course affecting the work of regional organizations such as GCHR. In parallel to the bureaucratic scene, HRDs living in conflict zones have found themselves in double-jeopardy: fighting for their survival and in some cases their families’ survival while also fighting for human rights, proper documentation of violations, transitional justice, women’s rights, etc... This is time and energy consuming, especially when you find yourself in clash with your own societies for instance if you get defamed for being an LGBTIQ activist; or when you find your colleague was killed in a prison a long time ago, while you still hold on to their belongings waiting for them to come back, and you have to deal with the death fast to keep the work going. This is also impactful. What civil space is still available to operate in? It is safe to say that laws in the region, do not play on the side of HRDs yet. There have been so many precedents that show how hard it is to apply a proper codified law in our countries. For example, in Saudi Arabia, the law is not codified, which means the decision of a trial goes back to what the respective judge would have to say about the case. Before driving became legal for women in Saudi Arabia, Maysaa Al Amoudi and Lujain Al Hathloul were tried in a terrorism court for driving their cars. So it can be quite difficult to find space to operate in when it comes to laws. But we’ve found three methods to strengthen our position and try to keep whatever is left of civic space, open. Firstly, we’ve found we can work with the region’s link to Europe. I’ll give you an example where we’ve discovered that countries are buying surveillance equipment from European based companies. We decided to start a campaign that will investigate the use of the equipment to repress human rights and take it to the EU’s legal mechanisms. If our laws don’t work, maybe the EU’s laws would. Hopefully this pressure will stop those companies from selling surveillance tools to abusive governments using the tools to repress HRDs under the pretext of ‘anti-terrorism’ or ‘cyber-security’. Secondly, we focus on developing more international and regional collectives. That’s why at the Gulf Centre, through work training and coaching, we’re able to get HRDs from the region and encourage collaboration; getting people from different areas, different sectarian backgrounds, working on different human rights issues, so that they can exchange ideas and share information. This creates solidarity, which despite increasing challenges, gives us a small window of hope. It is important to note how important the will of those HRDs is when it comes to taking a step forward and keeping the work up despite the clampdown. If one door is closed they would open another door themselves. Thirdly, we focus on being present in international spaces to keep the region and what is happening to it, in the record. This has also found reprisals and challenges, but it is important to shed light on the lack of civic space to call for reform and bigger spaces. What are the strengths of civil society that give you the most hope? The people I work with are the most motivational people I’ve met. Despite all of the death around them, the threats and violence that they’ve seen, they still carry on - whether it’s on a low profile or high profile. What’s even more impressive is that they always find a way to mitigate a risk. If I’m being censored on the internet? I use my digital security skills and get on the deep web or use a VPN. If I’m faced with the death or imprisonment of a colleague? I fight for the truth, I fight for their release and I also fight for whatever values we were working on together in parallel. If I’m forced to be in exile? Well, I’ll utilise that space and go around the world to advocate for the people I was made to leave behind. Behind each story there’s a name, there’s a force that’s so strong it keeps going no matter what. And even those who chose to leave the fight, they are strong enough to stop where they found it’s either their survival or their work, and that’s also something I respect and admire. I have hope, and merely having hope - despite all the government clamp downs - tells you a lot about HRDs in our region.